It’s in 960 that the castle of Saissac is mentioned verbatim. On this date, he was bequeathed by Hugues, Bishop of Toulouse to the Earl of Carcassonne. In the 11th century, the lords of Carcassonne infused the seigniory with vassals of the region and thus born the lineage of Saissac. The most illustrious character of this family is Bertrand de Saissac (1140-1202), protector of the troubadours and cathars, he was notably the famous tutor of Raimond Roger Trencavel from 1193 to 1199.From the beginning of the Crusade against the Albigensians (1209-1229), the lords of Saissac went to Simon de Montfort for fear of reprisals by the armies crossed. The seigneury thus passed into the hands of the barons of the North: Bouchard de Marly in 1209, then Lambert de Thurey in 1234. The seigneury was then divided into two between the lords of the North and certain members of the Saissac lineage who possessed rights and Lands, on the condition of swearing fidelity to the King of France and of no longer tolerating Catharism. It is probably after the Crusade that the “castrum” of Saissac (medieval fortified village, located at the foot of the castle and whose vestiges are still visible) moved to the location of the present village. In 1518, Bernuy’s family (rich pastel merchants) inherited the castle and transformed it into a comfortable residence. Subsequently (1565), the family of Clermond-Lodève adapts it to the artillery and during the Wars of Religions, troops are lodged in the castle. 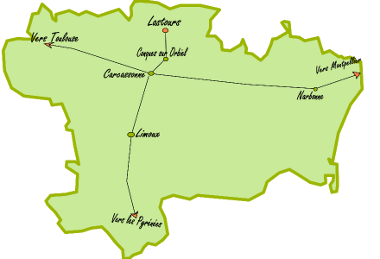 Becoming marquisate from 1604, it will belong to the House of Luynes from 1715 to 1789. During the French Revolution, the castle was confiscated and sold as a national property. Various owners follow one another, including a company of treasure hunters who dynamite the dungeon and search the rooms in vain. However, the “treasure of Saissac” was discovered in 1979 during works in the commune: it is composed of 2000 deniers dating from the end of the XIIIth century. In 1994, the building and its surroundings were bought by the municipality for the symbolic franc. Thereafter, from 1996 to 2000, campaigns of consolidation with a view to opening up to the public. From 2004 to 2006, important works on the Aldonce house allowed the rehabilitation of two rooms in the spirit of the 16th century. The most unknown of the Cathar castles and yet! It is the oldest and one of the largest, a Carbon 14 analysis on a fragment of charcoal, included in the dungeon of the dungeon gave the approximate date of 900 for the construction of this fortification.